Submerged in a world of boys, I was thrilled when I found out that my BFF/business partner was pregnant with a girl! You may remember the foxy baby shower we threw for this foxy mama, and I also gave you a peek at the nursery when I shared the DIY teepee that I designed for her sweet little girl, but we have yet to share the entire room until now! 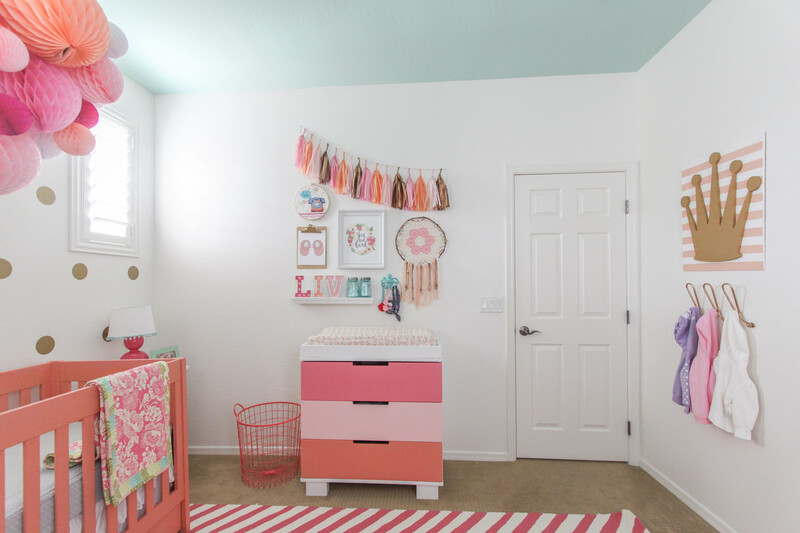 Here’s Liv’s boho chic nursery! This room is FILLED with lots of budget-friendly DIY projects, starting with the crib that was passed down from Liv’s two older brothers. With some time, love and paint, this hand-me-down is the perfect pop of coral for this sweet lil’ lady. Next, the well-loved dresser—which was also passed down to Liv—received a makeover with this sorbet colored paint treatment. A tissue tassel garland and found pieces of art from local vendors were combined to create the darling gallery wall above the changing area. Shannon had a blast creating numerous DIY projects to complete the space, like this simple but crazy cute lamp. She spray painted the base raspberry pink to match the decor and then added pom pom trim around the base of the shade using hot glue. Because everything is better with pom pom trim! Just look at all of the darling details that can be found around the room. Old bookcases also received a coat of shimmery gold spray paint for a fresh new look. Felt balls were strung on twine to create a garland that now hangs in front of the window panels for some added texture and a pop of color. Shannon hung honeycomb balls gathered in a cluster above the crib as a focal point. I am so loving all of the sorbet colors! We used our vinyl cutter to make 4″ metallic vinyl dots to cover the crib wall with a cute offset polka dot pattern. Shannon decided to paint the ceiling a soft aqua, and it turned out simply dreamy! A basic lamp was made boho chic with some easy DIY yarn tassels. Every corner of this room received such darling DIY details—Liv is one lucky little lady! Now how about one last look at her boho chic nursery? We’re Celebrating Baby Einstein and First Birthdays with a Pin Party! Very sweet room! I especially love the rabbit ear pillow and stripped piglet! This room is so beautiful! I would LOVE to know where you got the marquee letters and the curtains?